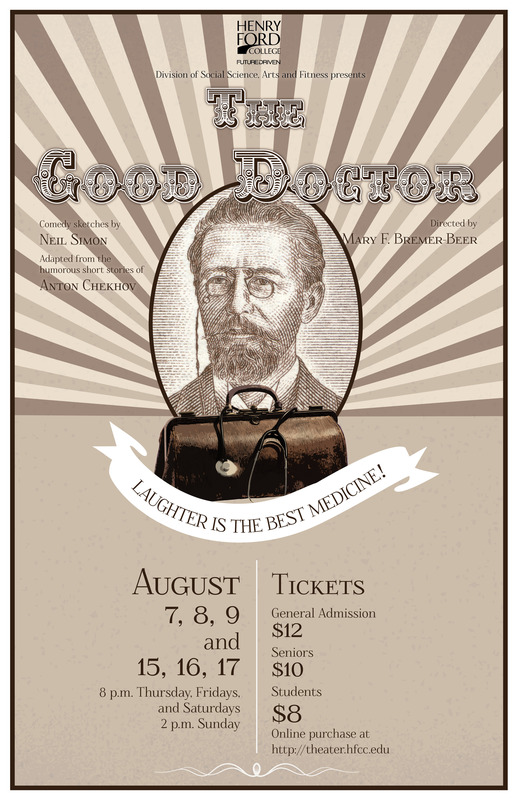 Henry Ford College Social Science, Arts and Fitness Division presents THE GOOD DOCTOR, a comedy by Neil Simon. A hit when it first premiered on Broadway, THE GOOD DOCTOR is Simon’s delightful adaptation of short stories by the playwright Anton Chekhov. Set in Russia in the late 19th century, this series of sketches features a man who sneezes on his boss and can’t stop apologizing, a dentist’s apprentice who tests his skills on a priest with an abscessed tooth, and even an unemployed sailor who charges admission to his own drowning! Performances run Thursday through Saturday, August 7-9, and Friday through Sunday, August 15-17. Showtimes are at 8 pm Thursday, Fridays and Saturdays and at 2 pm Sundays. Tickets are $12 for general seating, $10 for seniors and HFC staff, and $8 for students with ID. For reservations, call (313) 845-9817 or visit theatre.hfcc.edu and click on the “Buy Tickets!” link. “The Drowned Man”: Richard Summersett, Jr.
House Staff: HFCC Theatre Students & Volunteers. “Too Late for Hapiness”: music Peter Link, lyrics by Neil Simon. Copyright, 1973. Arranged by David Alexander.